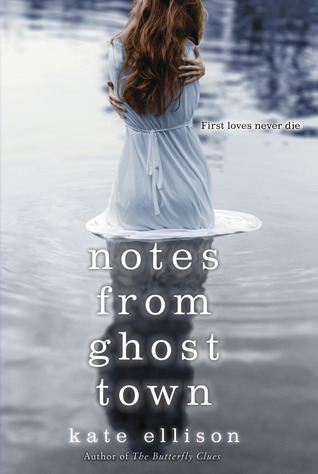 When sixteen-year-old artist Olivia Tithe is visited by the ghost of her first love, Lucas Stern, it’s only through scattered images and notes left behind that she can unravel the mystery of his death. There’s a catch: Olivia has gone colorblind, and there’s a good chance she’s losing her mind completely - just like her mother did. How else to explain seeing (and falling in love all over again with) someone who isn't really there? I am a fan of Ellison's debut, The Butterfly Clues, so I was excited to read her sophomore novel especially with added ghosts, mental illness, and murder. The opening chapter of this story was absolutely spectacular! I can't remember the last time I read a first chapter like that! The story quickly moves into the mystery of Stern's death and Olivia's mothers mental illness. Olivia struggles with the fact her mother has officially gone over the edge, lost her mind. I love the relationship between Olivia and her mother. Olivia reflects back onto the good and bad times with such love, admiration, and fondness. Olivia's relationship with her father is not so perfect...on the account of the fiance. Olivia's parents split just before her mother's breakdown and Olivia isn't taking the step-mom-to-be very well. Understandable, for sure. Instead of making this dynamic absolutely stereotypical, Olivia's step-mom-to-be has a daughter whom Olivia loves to pieces. This young girl adores and looks up to Olivia, and my heart melted when Olivia put all of her feelings aside about the fiance and loved that little girl right back. I thought that was so incredibly special and was thrilled to see it played out like that in the story. Since her best friends death, Olivia has lost the sight of color. This does Olivia's budding career as an artist no good. She sees this as a sign of her impending mental breakdown and keeps it a total secret from anyone. Olivia is good at keeping a lot of secrets. She doesn't tell anyone that Stern has been visiting her. Not in her dreams, but right there in her bedroom. Young readers will love the light paranormal ghost element and the childhood romance that will never be. Like the saying goes, when a door shuts another one opens. Even through the stress of the impending trial, Olivia has a second chance at finding happiness. Austin's timing isn't exactly perfect and he has more secrets racked up than Olivia, but you want one thing to go right for the girl and hope the odds aren't all stacked up against them. Good mystery and an amazing opening!